Just shy of 10 years after FairPoint Communications acquired Verizon’s landline properties in the northern New England states of Maine, New Hampshire, and Vermont, both the company and its name are disappearing forever. Consolidated Communications, which announced it would acquire FairPoint in December 2016, intends to put FairPoint’s name and reputation behind it, and is rebranding the phone company as Consolidated Communications with plans for significant broadband upgrades for its customers. FairPoint bought the assets of Verizon’s landline network in the three northern New England states in 2007 for $2.4 billion. The transition from Verizon to FairPoint did not go well, and the company stumbled for years trying to keep up with billing and service problems and the need to continually expand broadband service to stay competitive, all while also trying to pay off the debts it incurred in the acquisition. The company failed on all accounts and declared bankruptcy in 2009, eventually emerging with a new business plan in 2011. FairPoint’s performance post-bankruptcy has relied on cautious spending, cost-cutting measures and benefits cutbacks for its employees, which triggered a 131-day strike in 2014 among FairPoint’s union workforce — the longest walkout of any company that year. Replacement workers sent in to handle service calls and network maintenance were criticized by customers and lacked experience to manage New England’s rough winters. By early 2016, executives claimed their “turnaround” plan for FairPoint had made significant strides. By that summer, activist shareholders were demanding FairPoint be put up for sale, in part to allow them to quickly recoup their investments in company debt that could not be monetized unless another company acquired FairPoint and assumed those debts. In late 2016, Consolidated Communications did exactly that, acquiring FairPoint’s assets in northern New England and many other states where it operates small phone companies for $1.5 billion — a significant drop in value for assets that sold for nearly $1 billion more nine years earlier. Rob Koester, Consolidated Communications vice president for consumer products clearly wants to put FairPoint behind him. Some of the biggest planned changes appear to be more job cuts. Consolidated recently eliminated FairPoint’s state president positions in Maine, New Hampshire, and Vermont and will depend on regional management instead. The phone company will also once again face negotiations with unions that represent much of its workforce later this year. Most expect the unions will not be friendly to anticipated company efforts to further consolidate and reduce benefits. Promised broadband upgrades from speed increases come with few details, except a broad commitment to raise speeds for 300,000 internet customers over the course of this year — which represents about 30% of FairPoint customers. Spokeswoman Angelynne Amores claims there will be no price hikes for faster internet speeds. But Consolidated will also be under the watchful eye of Wall Street, which does not want the company to invest too much in broadband upgrades until shareholders are comfortable with the company’s financial future. There are few business successes in wireline acquisitions and mergers these days, as Frontier Communications can attest from its purchase of Verizon’s network in Florida, California, and Texas. Any upgrades cannot come soon enough for FairPoint customers forced to endure its DSL service as their only internet access option. Michael Charter, a FairPoint customer in Jericho, Vt., lives just outside the state’s largest city, Burlington, where there are several internet service providers. 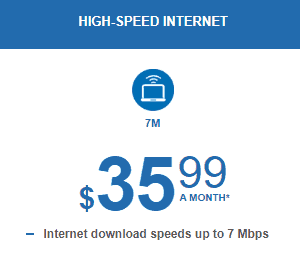 But in his part of Jericho, FairPoint is the only broadband provider available, and it does not come close to offering actual broadband speeds. Charter told the Associated Press his current solution is to buy two DSL accounts from FairPoint and divide up the load from his family’s streaming, internet browsing, downloading and telecommuting across two different accounts. His television and computers share one FairPoint DSL account hooked up to one router while other internet usage is confined to a second router connected to a second account. FairPoint is unable to bond the two connections together to increase speed, so two slow DSL lines is the best option for him for now. Consolidated isn’t likely to make a lot of money taking over FairPoint’s residential and business landlines or DSL accounts. But it could earn substantial revenue from FairPoint’s extensive fiber network laid across the three northern New England states it serves. Companies and public institutions rely on fiber connectivity, as do cell towers — including the future swarm of 5G small cells expected to eventually be placed across the phone company’s footprint. The phone company’s biggest rival is Comcast, which has some cable coverage in the region, but large sections of all three states are bypassed by Comcast and Charter Communications, which has a substantial presence in eastern Maine.